Revival of seats after severe flood damage in 2011. Queensland Tennis Centre is located in the heart of Brisbane, it boasts the 5,500 seat Pat Rafter Arena and 23 International Tennis Federation standard courts and is the home of Tennis Queensland. In January 2011, after three weeks of torrential rain across the state of Queensland, the weather front hit Brisbane with full force. The damage to Queensland’s sports venues was considerable and the iconic Queensland Tennis Centre experienced several metres of flooding. The lower tiers of seats within the stadium had been completely under water and once the water subsided they were left with the massive task of clearing up. 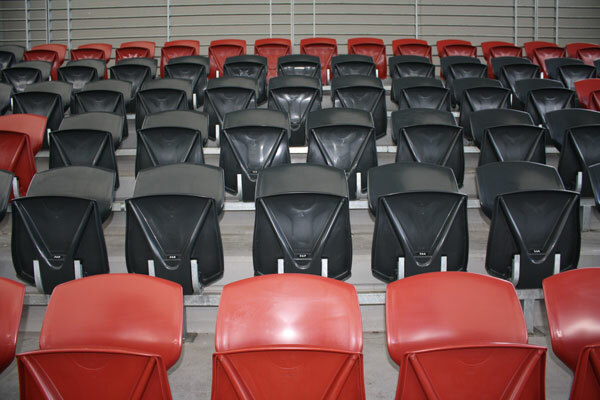 The seats are 3 year old Sebel Viva stadium seats. Despite extensive cleaning and water-blasting the fine silt residue continued to leach out of the plastic. The Seat Renew Process works at a molecular level to restore plastic back to original condition and then a unique sealant locks in the results and prevents against further deterioration. 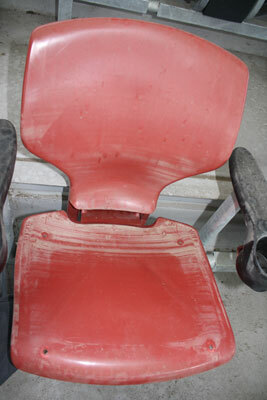 As the photos show, plastic restoration has banished the silt and renewed the stadium seats to a bright and shiny condition, just like new.